The adjective "iconic" is so heavily misappled these days that it means virtually nothing now. But this radio really is an icon. It's one of the symbols of the Depression era, along with Dorothea Lang's famous photo; but it's also an icon of a typical radio receiver itself. If you had to draw a garden-variety radio for an illustration and you needed people to instantly recognize it as such, drawing a little cathedral radio would do it better than anything else I can imagine. Throughout the 1920s, tabletop radios were all variations on this, a wooden (or sometimes metal) horizontal rectangular box with a separate speaker that sat on top of or at the side of the cabinet. Batteries were also separate, usually stored on a shelf underneath the table top. If you wanted everything together, you got a console radio, which sat on the floor. Beginning around 1929, someone (maybe Jackson-Bell) introduced the "midget" radio, a small tabletop that took the basic features of a console and shrunk to tabletop size. You had a metal box called a chassis where all the electrical guts were mounted. The chassis was shrunk and everything jammed together as tight as could be; this was bolted into a small cabinet, and the speaker was mounted in the cabinet directly above it. Instead of having a horizontal, coffin-shaped box, you had a squarish, vertically oriented box instead. Technology had also advanced so that the big batteries were replaced by a simple AC wall plug. Jackson-Bell (or Peter Pan, or whomever) may have introduced the basic idea, but Philco adopted it quickly and cashed in. Their first midget was the Model 20, introduced right about the time of the stock market crash, and for sale in 1930. It retailed for $50 (tubes were extra), but figuring that you could usually buy it on lay-away or on installments, and it was surprisingly affordable. It was also very stylish. Philco called it the "Baby Grand" (their console-size equivalent was called a "concert grand"), but people thought the arched top and the design over the speaker made it look a bit like a cathedral. The original Model 20 cabinet is plain-faced, with a little carved filagree down the sides. They then revised the cabinet a bit, adding a contrasting border around the top and fluted columns on the sides, which added to the cathedral affect. This cabinet was called the Model 20 Deluxe. Internally it's the same radio. The radio sold huge—over 300,000 copies, according to the book Philco Radio, 1928-1942, and they quickly updated and sold a number of variations. Later versions have a simplified speaker face design. The Model 20 (both versions) have a more detailed design. The later models, such as the Model 70, have a simplified version that was probably less expensive to make. The later models also built on the cathedral design points; the later versions, especially the models 70 and the 90, had a layered, three-dimensional effect and more pronounced columns; these are the models that are usually copied in reproduction versions later on. These grills are art-nouveau, which is an art style that took inspiration from nature: the swirling patterns mimic vines. Later Baby Grands used art deco styling, which was inspired by industry and machine-cutting: the emphasis was on straight lines and strong geometric shapes. My Model 84B is an art-deco design. As mentioned below the Model 20 is a Tuned-Radio-Frequency design, which was adequate but not the most desirable type. The Models 70 and 90 were superheterodyne versions, which performed better. Bought from the local thrift shop for $30. Model 20s are usually pricey but this one's got some veneer problems on the grill; but on the upside it has all its knobs, which is not always the case. So all-in-all it's in pretty good shape. An awful lot of Philco cathedrals have speaker-grill damage—often the wood is broken out completely. Electrically, this is a Tuned-Radio-Frequency (TRF) radio—you have to get a later Model 70 or 90 if you want a superhet. TRFs work on multiple stage RF amplification: you feed the signal in from the antenna through a tuner for the frequency you want, and amplify it using a tube; then you pass that signal through a second tuner, also to the same frequency, and amplify that signal; then through a third tuner and tube. Then you send that signal through a detector and then to the audio amplifier. TRFs in the 1920s had three knobs, one for each tuning section. By the late 20s manufacturers could make a three-stage tuning capacitor that tracked well enough that you only needed to turn one knob to tune the radio. One-knob tuning was one of the big technological leaps that made radios a practical home appliance. Still, TRFs were a dying technology. It's difficult to amplify RF well over a range of frequencies. Superheterodynes take any RF frequency and convert it into one, fixed frequency and pass that to a circuit that's optimized to amplify the hell out that single frequency. That's why superhets quickly took over the world. But you had to pay RCA a royalty to use the superheterodyne circuit, and many manufacturers, such as Philco, hated that. Once the superhet patent ran out, everyone adopted it. So as I mentioned above, there are two different cabinets but the chassis is the same in both versions. But there are a couple of variations in the electronics. Early radios (first few weeks of production) have one or two compensating condensers for tuning; later ones have three. There are two chassis, the 20 and the 20-A. They're basically the same except that the 20 is meant for standard 50-60 Hz AC wall power; the 20-A can handle 25-60 Hz AC wall power. The difference in electronics, as far as I can tell, is that the line filter condenser values are larger in the 20-A to compensate for lower cycles. I haven't had a chance to do anything with this yet. I'll update this page as I find out more about it. Current status: on the shelf; needs cabinet restoration, electro-mechanical evaluation. The shematics can be found in Riders Perpetual Troubleshooter Manuals Volumes 1 and 2. The Model 20 (among others) is mentioned in Philco's Complete Instruction Manual for Adjusting all Philco Radios, page 22. TubeRadioLand.com has a nice overview of the model. The Philco Repair Bench has a lot of excellent information if you're going to work on these things. McClellans.com has a brief restoration article. 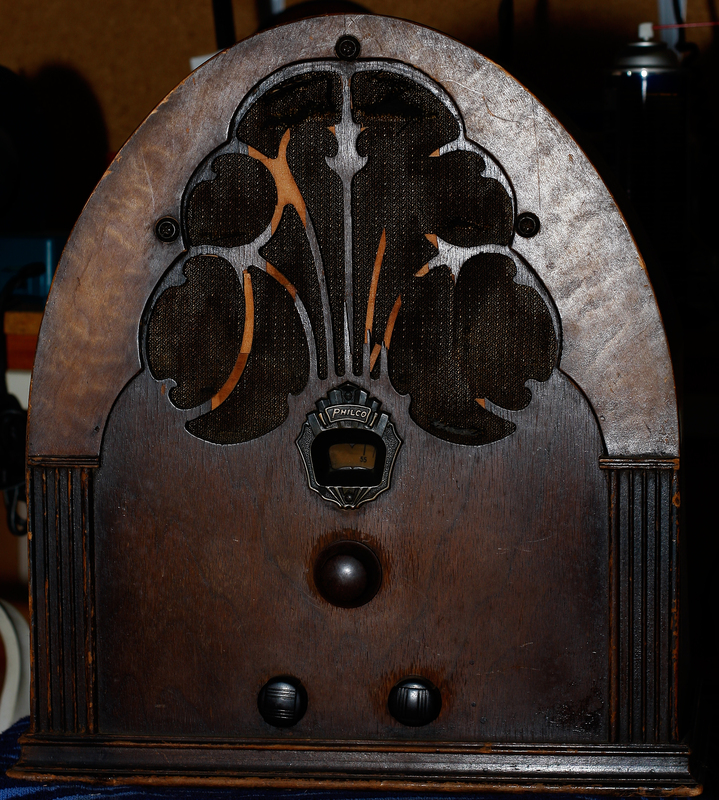 Paul's Tube Radio Restoration also has a restoration page.